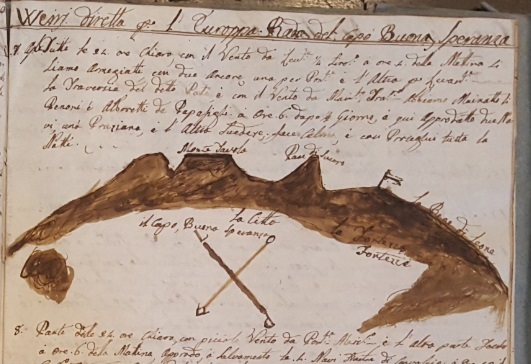 A discovery, among the heterogeneous manuscript materials of the archives of Villa Mosconi, has awakened and still arouses great curiosity and interest, for the undoubted uniqueness of the subject. 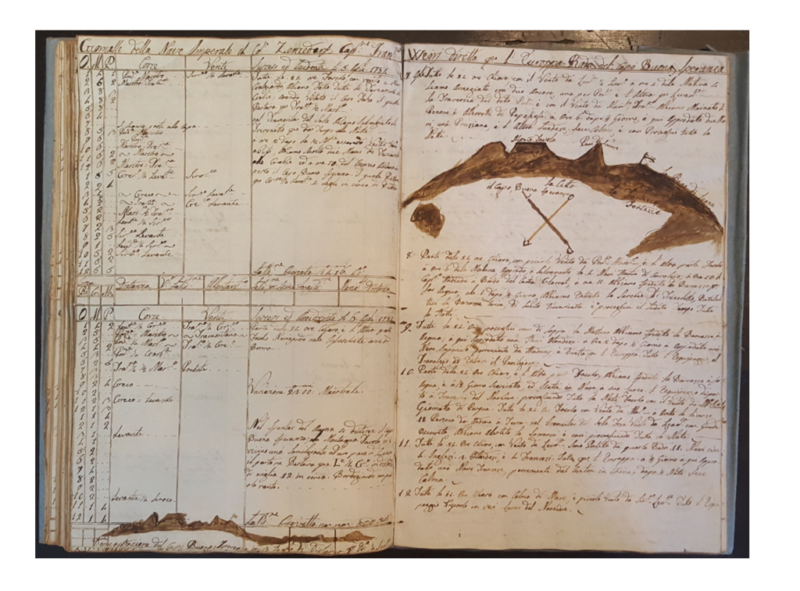 It is the ship’s journal, or log, of an eighteenth-century sailboat: a large format, in excellent condition, of about 130 pages compiled with diligent and sharp handwriting. While taking into account the family links with the shipowners environment, created in later years (marriage in Padua of the daughter of Clarina Mosconi, Teresa, with Spiridione Papadopoli in 1831), it is still difficult to explain the presence at Sandrà of such a document, emerging among cartridges, maps and books that are indeed well connected with the interests of the Mosconi family, the historic national and local events of the Sandrà community. Dr. Alessandra Garofalo from Trieste is conducting a research and finding insights into the journey and history of the ship. Here is what she writes about it. This manuscript is one of a kind. It is the journal of the ship “Count of Zinzendorf”, flying the flag of the Imperial Asian Company of Trieste, who from 1782 to 1784 traveled from England to China with 133 crewmen. The ship was purchased the previous year by the Austrian authorities through the British East India Company. The log indicates the ship’s events daily. From the shipyard after the refitting for the change of Owner, to the journey to Asia following the Atlantic route, passing off the Canary Islands, then descending to the Cape of Good Hope and meeting the Indian Ocean until the passage between the Sumatra and Java islands and, after that, a stop for supplies in Jakarta. From there, the ship continues sailing the China Sea to its final destination of Canton, at that time the main trading city of European merchants with Asia, where Chinese products such as rice, tea, spices and silk were exchanged with Austrian national goods or purchased with silver lingots. The journal, written by First Pilot Pietro Abriani under the command of Captain Willhelm Bonus, is the official document on which were recorded the daily ship’s latitude and longitude, the winds, the weather, the compass pads and all the “accidents” that influenced the trip, such as illnesses on board, deaths, encounters with other ships. The Imperial Asiatic Company had a short and troubled life (1781-1785) and investigations with the Viennese and Trieste archives confirmed that the document in question is the only survivor of its kind to this day. In the photo, the pages in which the compiler, with very good will, traces the skyline that appears to him at the passage of the Cape of Good Hope on April 5, 1784.